Okay, so this one has come straight out of left field. Apparently soft drink giant Pepsi could be about to launch its own smartphone. 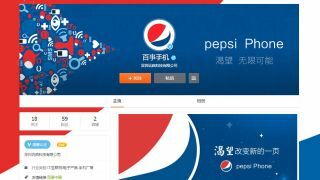 A verified Weibo (Asia's Twitter) account has sprung up with the name "Pepsi phone", leading people to believe it's about to create a fizz in the mobile industry. Of course, this is just pure speculation at this point - perhaps Pepsi is bringing its brand to mobiles with an app, or it could be part of a wider marketing campaign - but it's something we're going to keep a close eye on. Hugh Langley, techradar's Pepsi correspondent, said: "I prefer a nice Fanta". The question now is: will Coca-Cola react?